When Do Your Mistakes Become Your Decisions? David asks his question in an interesting way — it really cuts to the heart of the matter. Before going further, let me say that I agree with David; a repeated mistake is a decision. But his question deserves a deeper analysis. Let’s assume that we are talking here about any kind of leadership error or mistake, any behavior that is less than optimal, that leads to decreased performance. It would be necessary, would it not, for us to be aware we had made the mistake? Lack of awareness that there is a better way takes the decision out of the equation. We might accuse someone who isn’t aware that his or her behavior is a mistake of being naive, of lacking experience, or even of being ignorant — but we can’t accuse them of deliberately deciding to committing the error. Even if awareness exists, we must accept that we are actually making the mistake. It is an interesting facet of human nature that we seem to have some real difficulty in this. We can readily see a mistake others are making; we fail to accept it in ourselves, even though it is the same mistake. Just as with awareness, acceptance often requires someone else — a trainer, a coach, or a mentor — to help us see mistakes we can’t see for ourselves. Because we’re in the season when many of us are thinking about New Year’s Resolutions, let’s probe even deeper. 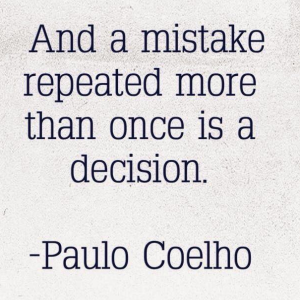 Repeated mistakes have a way of becoming a habit, a rut, even — dare I say it? — an addiction? I’ve seen lots of people, and I’ll bet you have too, who KNOW they don’t want to repeat a mistake, yet they continue to do so and almost seem as if they can’t help themselves. That’s a tough place to be. Yes, continuing the bad behavior is a choice, a decision. But it can be awfully hard to extract ourselves from that habit, even when we want to. The vicious cycle in Figure 1 reinforces itself over and over. If you find yourself in a leadership rut (or habit, or addiction), don’t expect to extract yourself instantly. 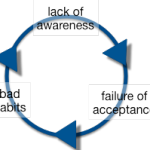 You’re aware of the problem, you’ve accepted responsibility for it, but now you have to work on changing your habits. That means celebrating small victories when you do use the right behavior, and not getting discouraged when you fail. Our Leaders Ought To Know course, “Knowing Your Leadership Style: What to Do and Not Do” focuses on this very issue. As a leader, here’s my to-do list. I invite you to make it yours. Awareness — Do everything in your power to learn about the best ways to lead. 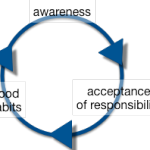 Acceptance — Take responsibility for your own behavior when you identify a change you need to make. Habits — Make a decision now to take advantage of every opportunity to practice the right skills and to get rid of the wrong ones. That’s a great way to start the New Year off right! Good question; good evaluation; good responses; good food for thought.